Going to a library brings a smile to my face, even if I’m there to pay a fine. Seriously! One recent busy Saturday between grocery shopping and the other busyness of the day, I stopped off to return some overdue books and pay a fine, and found myself grinning and suddenly happy, just because I was spending a few minutes in the library. It’s like magic, and I was thrilled and grateful to notice this amazing effect. I rarely spend long periods of time in the library now. I probably walk through the doors of my local library once or twice a month. Every time I do, I feel right at home, and there’s a little pull that tempts me to stay longer. 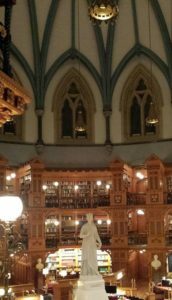 Every library I’ve walked into has been a place where I’d be happy to stay for hours: from the tiny library in Sioux Lookout, Ontario, to the grand Library of Parliament here in Ottawa, which I was fortunate enough to see on a tour with a friend. I’ve been going to the library since before I can remember. I have fond memories of taking out as many books as the library allowed in summer and on March break. One year, I worked my way through every available colour in the series of fairy tale books that included The Red Fairy Book and The Blue Fairy Book. The Thunder Bay library had a surprisingly large number of them. I love libraries wholeheartedly, without reservation, the same way I love books and stories in other forms. My local branch has certain areas of seating where conversation is encouraged — a smart move, given that it’s right beside a high school. Once Thing Two was there with a friend, and staff offered snacks and pens as a way to promote the use of the social space. This week I heard a story on the radio that brought all sorts of happy library thoughts to mind, and magnified them to include an appreciation of people who love libraries. It’s a story of everyday library users against government, and it has a happy ending. The Saskatchewan government was planning to cut funding to libraries in its upcoming budget, a move that would mean cutting services in small towns in the province, and possibly even closing some libraries. Library patrons protested, wrote letters, staged read-ins. People who’d never been involved in a protest in their life came out in small towns and cities. A facebook group gathered some 8,000 members. People in small towns who rely on libraries for internet access, people scattered across the province, banded together online and showed up to tell the government how important some voters consider libraries to be. Some of the protests involved sitting down outside government offices and reading. And the provincial government actually listened to the people and reversed its decision. I heard an interview with the woman who started the facebook group, and she said some of the people who protested had never even seen a protest, and had to watch videos online to find out how to do it. That says a lot about how much other people believe in libraries too. I love the accessibility of libraries. A library is a great place to spend a couple of hours. It’s safe and warm, and it’s perfectly acceptable to hang out there for hours — without having to buy coffees. love the possibilities of a library: who knows what book I may discover while browsing the shelves? I also enjoy looking at the different kinds of people who go to libraries. I automatically feel a sense of kinship with them. In fact, I think I’ve finally realized why I always had trouble settling on my happy place. You know those exercises where you’re supposed to picture yourself in a place where you feel content? I always tried a beach or a forest, which are places I love. But I never could quite settle in the mental images. Now I’m almost certain that I’ve found my happy place. Certainly, I don’t feel like grumbling when I’m at the library. I think even if Grumblings sneaked into the library with me, he’d succumb to its charm and either get lost in a good book or tuck his head beneath his wing and snooze. He’d know as soon as he felt my happiness that there was no point in trying to cause trouble. Any library stories you want to share? What’s your favourite library? Share in the comments or send me an email, at susan at goodbyegrumblings.ca. ←I thought I was cranky. Turned out I was sad. Word lover. Story addict. Daydreamer. Optimist. Ottawan. Treehugger. Scouter. I remember smelling the children’s books in the children’s section when the library was upstairs in the Earl Armstrong arena (now a seniors’ centre). Loved it! I remember that too. Nothing like the smell of books, old, new. In the summer, before summer jobs, I’d wait anxiously for the afternoon when the library would open. I couldn’t understand why it wasn’t open all the time. I still think 24/7 libraries is a great idea. I, too, love my public library for all the reasons you listed. I am encouraged to hear that there is a government that listens to its people, especially about libraries. When I lived in Washington, DC I went to the Library of Congress a few times. That is an impressive place. It is encouraging, isn’t it? Thanks for commenting. I love the image of a happy Grumblings- he’s probably tucking his tail around him, too, as he drifts off. Or should that be “tale”? Libraries are special places that always teach us something. Sometimes it’s just the reminder to count our blessings. Like the way that, during inclement weather – which is the best time to be in a library anyway — city libraries often manage to gracefully shelter smelly homeless people. Seeing this, one can’t help but be reminded that we are all just people. Yes, people who all deserve to hang around with books. (-: Maybe the library should have dragon chairs… it would be a novel idea. ooooh… now you’re making a folio ‘t of me. Time to close the chapter on this one? And lest you forget, I was a volunteer librarian for over 5 yrs. Perhaps that was part of the secret the night we met. Kindred spirits who love stories — it was magical! I love them too! The smell of books, the silence, the complete and utter lack of rushing… I understand why it’s your happy place. Who is Grumblings and why say goodbye?